This project will critically consider the intricate connectivity between the lack of rainfall in the Horn of Africa, particularly in Somalia and Northern Kenya and ultimately the mass displacement of people, which has exacerbated the social and political conflict that already characterizes the region. While the region is historically known for its fluctuating climate conditions, all evidence indicates that these circumstances are becoming more severe in recent decades as a result of the altering global climate. The effects of regional climate change have ultimately begot a situation of forced displacement and migration of peoples either to urban centers (climate change IDPs – internally displaced persons) or across international boarders (climate change refugees). This profound movement of people is inciting further conflict in areas already plagued by political instability and weak governmental control, and has put a severe drain on limited local resources (both economic and food). These increased nodes of viable conflict can be seen at multiple levels, with an increase in communal and clan-based violence in this region to the militarization of IDP and refugee camps (particularly in Northern Kenyan), which is one factor that impelled the Kenyan Government to invade Somalia on October 16, 2011 (Zenko, 2011). However, there is no question, that these increased incidents of conflict (which have the potential of propelling the two states and perhaps the region into a dire and destabilizing conflict), have been dramatically exacerbated by the effects of climate change, and when coupled have created the current regional crisis, which so far has displaced over a million people (UNHCR, 2011) and has put an estimated 150,000 to 300,000 (“SOMALIA”, 2011) at risk of starvation. The current strife between Kenya and Somalia dates back to a time before such names were even used to decipher their arbitrary borders. In fact, resource scarcities and the crippling effects of dry climates have plagued the nomadic, clan-oriented pastoralist of the Horn of Africa for hundreds of years. 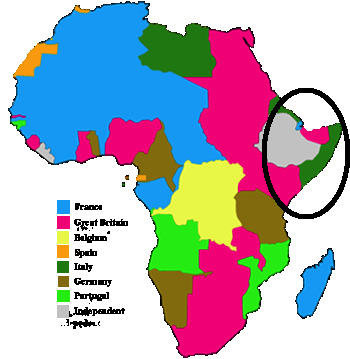 The case of the Somali-Kenyan conflict dates back to the arbitrary slicing of the African continent, or what is otherwise referred to as the “1914 scramble for Africa”. It was in this time period when the British claimed Kenya and Somalia was fractured into two different colonies. The Northern portion of the country was sequestered by the British and the Southern (and larger portion) controlled by the Italians. Like in many cases in Africa, arbitrary lines sliced populations leaving clans close to the border with similar backgrounds and languages. Even today, portion of the Kenyan community in the Northeastern region maintain their roots as ethnic Somalis (Menkhaus 2005). However, conflict was prevalent in this region even from this early time, as territories were fought over by among clans and bloodlines. While clans clashed over territories, they most importantly fought for the control and access to the limited water, grazing land and other limited resources in this region. As Bariagaber suggests, “…'internecine segmentary conflicts' has been a constant feature of Somali social, economic and political life” (Bariagaber, 2006, p. 31) and arguably this way of life still represents the tenets on which conflicts in this part of the world are fought. However, conflict became truly hardened between Kenya and Somalia post-independence, with the notions of a “Greater Somalia” and the interstate conflicts that ensued in the 1960s. Somalia was a unique case as far as post-independence on the African continent. While most African nations looked to galvanize unity within their borders after gaining freedom from the colonial misers, Somalia’s ambitions were of unifying a population outside of its borders. 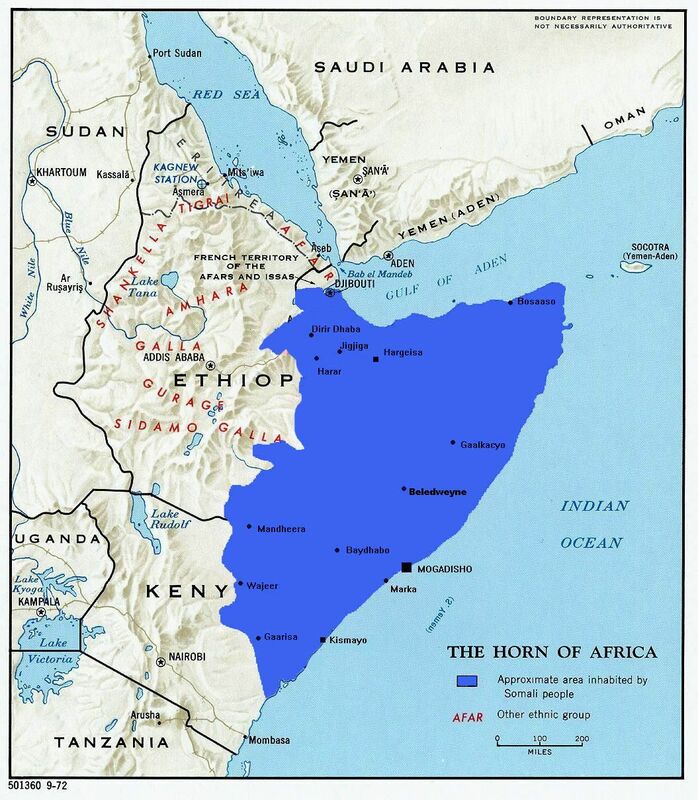 Somalia’s post-independence solidarity movement was the country’s attempt to join the regions held under different colonial rule (including Italian Somaliland and British Somaliland as well as the Northern portion of Kenya and Eastern Ethiopia) as a voluntary solidification of Somali identity. The concept of a “Pan-Somalia” had infiltrated the post-colonial mentality of the national leaders was therefore infused into the country’s foreign policy objectives. This policy was seen as a rejection of the previous colonial borders emanating from profound political desire for the unification of all the Somalia populations (including those within in other nation-states such as Kenya, Ethiopia and Djibouti – at the time still under French control). However, strong nationalism and the irredentist policy engendered regional conflicts throughout the 1960s between Somalia and its neighbors, including Kenya. From 1960-1964, Somalia waged guerilla attacks, known as the "shifta wars" (shifta is a pejorative term used today to describe armed banditry (Menkhaus, 2005)), against Kenya as part of its Pan-Somalia campaign. However, Somalia suffered bitter defeat in its scheme for creating a “Greater Somalia” leaving the national psyche bruised beneath a heavy sentiment of powerlessness (Bariagaber, 2006). Even worse, this conflict between Somali forces and the Kenyan population fostered a draconian emergency rule in the North Eastern province in Kenya, which was not lifted until 1992. It should be noted that the clan-based violence, described earlier still plagued this region, and these conflicts were exacerbated by national tensions between Somalia and Kenya. Moreover, the Kenyan-side of the border is still referred to by many Kenyans as the "frontier", because it is a portion of the country with little to know state control or authority in either the colonial or post-colonial periods. Menkhaus suggests that, “Thousands of Kenyans have died in periodic communal violence in these border areas….in clashes that which sometimes produce causalities levels normally associated with civil wars” (Menkhaus, 2008, p. 28). Yet, while independence facilitated internal and interstate conflict between Somalia and its neighbors, this region faced true instability with the collapse of the Siad Barre regime of Somalia in January 1991, which had vast implications for not only Somalia and its people, but also for the Horn of Africa and the entire world. “The failure of the opposition to fill the power vacuum left behind by Siad Barre after his flight into exile in 1991marked the beginning of disintegration of Somalia. Therefore, observers of political development in the region will realise that armed resistance movements always threaten state security” (Wasara, 2002). This collapse of governmental structures (with the flight of Siad Barre after two final attempts to reclaim Mogadishu from his hold in the South, the former leader died in 1995 in Lagos, Nigeria) led to a protracted internal conflict, which the nation is still coping with today and the terming of the country as a “failed state”. However, this civil conflict has had vast repercussions, specifically for Somalia’s neighbors including Kenya, who witnessed a stark and immediate raise in Somali refugees entering the country, which has only exacerbated the weak and unstable conditions in areas prone to less governmental control and assistance (particularly in the North East province). Moreover, this large influx of refugees procured issues for the Kenyan Government and local communities with regard to the heightened levels of violence, poverty, lawlessness, terrorism, environmental degradation, communal and pastoral conflicts, governmental subversion as well as the general lack of physical capacity to house all the newly arriving refugees. This massive movement of people into Kenya, particularly from Somalia can be seen with statistics from the region. At the beginning of 1991, Kenya had never hosted more than 14,500 refugees at a time – but by mid-1992, Kenya had become home to nearly 400,000 refugees, mostly from Somalia, Ethiopia, and Sudan (Odhiambo-Abuya, 2004). Moreover, during the most contentious periods of conflict, roughly 800,000 Somalis took refuge in neighboring countries, with about 200,000 fleeing to Kenya. Now, twenty years after the initial government collapse, conflict in Somalia continues, as does the flow of Somali refugees into Kenya. 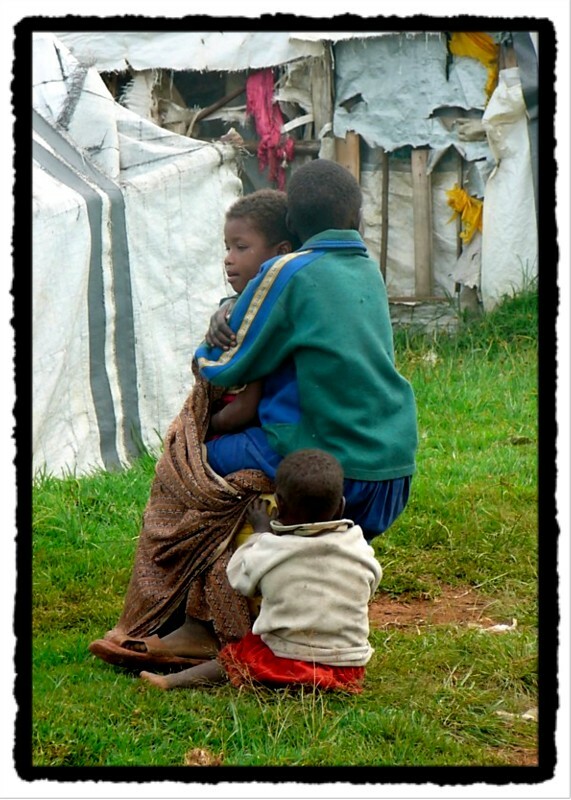 More than 560,000 Somali refugees are estimated to reside in Kenya at present (Sheikh, 2010). The increase in refugee populations coincided with several conflicts in the Northeast region of Kenya, predominately in areas relatively outside of governmental control and close to the Somali border. 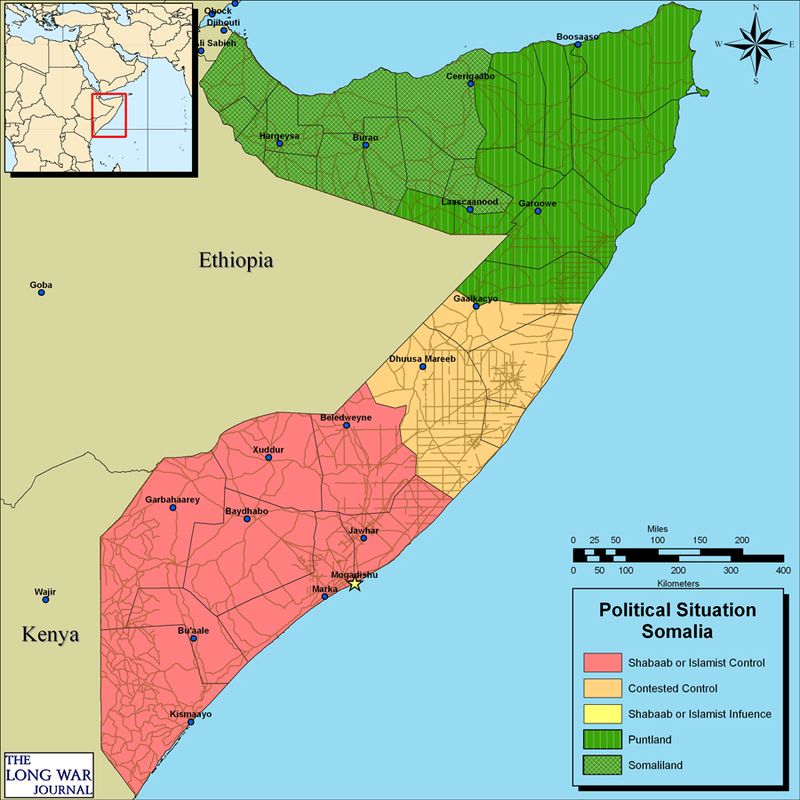 Moreover, with weak governmental structures that relinquish rule of law to the local clans, the area has witnessed an even more porous border (particularly due the demise of the Somali nation-state), which has become dramatically militarized, particularly as the illegal arms trade as utilized this region to galvanize militant recruits and to move illegal weapons. As violent armed conflicts rage in Kenya’s border region the Kenyan Human Rights Commission (KHCR) suggests, “That hundreds of armed criminals can terrorize a town for hours without the intervention of the country’s security forces is a clear indication that the government has little or no authority in the North Eastern region” (Menkhaus, 2005). The raise in regional conflict at the Somali-Kenyan border areas began to emerge shortly after the collapse of Barre government; however, conflict spillover and the lawless nature of the area are not the only explanations for the eruption of violent confrontations. In fact, other factors that attribute to the increased violence are: resource scarcities, the manipulation of ethnic tensions (often times by political authorities), tribal contentions, livestock raids, influx in arms, endemic poverty, governmental neglect, corruption and a cultural of collective culpability (Menkhaus, 2005)). The most notable conflicts occurred in Northeastern Kenya in the districts of Wajir (1992-1993 & 2000-2001) Isiolo (1980s), Garissa (1998-2000) and Mandera (2004). However, while these conflicts began to permeate Kenyan communities at the Somali border with the onslaught of the 1991 collapse it should be noted that many of these nodes of armed violence emerged from a history of resource scarcity, tribal tensions, pastoral competition and overall extreme poverty in the region. USAID suggests, “Many of the worst instances of armed conflict in the border region occurred in the 1990s and are now either resolved or at least in a state of suspended animation.” However, “They provide invaluable clues to conflict drivers and management for contemporary crises in the region, and in some cases have contributed to current problems” (Menkhaus, 2005, p. 20). In the wake of the Barre regime, Somalia has had no viable central government leaving the country’s political vacuum to be filled by Al-Shabaab* militants. Al-Shabaab controls the Southern region of the state and the areas around the capital, Mogadishu, leaving much of the rural areas to fall under the fist of clan warlords. This instability has left Somalia to fall under the auspicious of a failed state, which has become a serious liability for most of its neighbors, including Kenya. “Since 2006, the country has faced an insurgency led by Al Shabaab, one of Africa’s most fearsome militant Islamist groups. Al Shabaab controls much of southern Somalia and has claimed affiliation with Al Qaeda since 2007” (Kron, 2011). With little to no state authority in Northeastern region (dubbed the “frontier”) and militants controlling the Southern part of Somalia, this area has become a hot bed for illegal arms transfers, regional militarization (particularly in the refugee camps like Dadaab located in the Garissa District roughly 100 miles from the Somali border), and violent confrontations. Moreover, this general region has become a safe haven for terrorist groups, which has exacerbated local pastoral tensions in the region, particularly with the increased accessibility to arms. However, the region around this porous border has also provided an asylum region for those fleeing the violence and conflict waging in Somalia. This mass influx of refugees only worsened the tensions in this region (leading to the aforementioned conflicts), particularly in the North East Province of Kenya. Moreover, this large movement of peoples into Kenyan territory forced the Kenyan Government to enforce a de facto encampment policy in order to house the onslaught of refugees. Camps such as Dadaab (the largest refugee camp in the world), which houses three camps, was erected in this region (the Garissa District) and was originally designed to accommodate 90,000 refugees (Provost & Mohamed 2011). However, since June, 26, 2011, Dadaab houses 367,855 refugees, four times the intended population, (UNHCR Dadaab Camp, 2011) and the expected numbers are only going to claim reaching an estimated 450,000 by the end of 2011 (Fleeing Somalis Struggle, 2011). However, as conditions of political instability and lawlessness clearly define this border region (and the Somalia state at large), this area has also been dramatically impacted by the effects of climate change, which have not only augmented the levels of violence and the number of people displaced, it has also escalated the tensions in the region. The current tensions and violence that have consumed this border region seem to be most directly correlated with the changing rainfall patterns in this area. These altering patterns include a much drier and longer dry season and a shorted and more intense rainy season. These changes have increased the pressure on the land as there has been an rise in the desertification of the Northern regions, which is limiting the herding capacity of the land and forcing many pastoralists to move southward (Horst, 2006). Moreover, the IPCC’s (Intergovernmental Panel on Climate Change) projections suggest that by the year 2050, the Horn of Africa (including Northern Kenya and Somalia) will experience a 10% decline in rainfall (IPCC, 2011), which will most definitely insight migration and violence in the region, and further destabilize the region. Furthermore, lack of rainfall has starkly exacerbated already existing tenuous relations in the region, particularly in part due to vast resource scarcities that have arisen due to the warming climate, the drying water resources and depressed availability of arable land. Resource scarcities is a conflict driver in this region and has brought clans to violent conflict, and has also forced many to flee regions to due to inability to access livelihoods, particularly those based on rain-fed crops and access to water resources. However, this region has been plagued by droughts for centuries, and this current crisis is not the first experienced by the region. It is suggested that moderate drought is expected every four to five years in the Horn and parts of Eastern Africa (Horst, 2006). Yet, the 2011 drought is said to be the worst drought in 60 years (Brown, 2011), bringing one to think that the origins of the palpable increase in temperatures has emerged from sources other than the traditional and routine climate patterns. It is suggested that this increase in temperatures (that has been gradual over decades) is primarily due to the effects of a changing global climate, one that was engendered by man centuries ago. These drought-like conditions have especially impacted the Somali community. With little to no state authority in a landscape controlled by clan warlords as well as the lurking Al-Shabaab militants, food aid and other forms of assistance to this highly vulnerable population has been almost non-existent. “As drought ravaged Somalia in 2010 and 2011, causing a full-blown famine in several parts of the country, the Shabaab blocked starving people from fleeing the country. The group was widely blamed for causing the famine by forcing out many Western aid organizations, depriving drought victims of desperately needed food” (“Al Shabab”, 2011). Impacted by regional climate change, which is stripping farmers and pastoralists of their livelihoods, the region is also suffering from mass migration and dramatic food insecurity, roughly 1,300 people per day cross the Kenya-Somali border in July 2011 (Daily Nation, 2011). On October 17, 2011, the Kenyan Armed Forces invaded Southern Somalia after attacks on aid workers and foreigners in the Northeastern region of Kenya. The New York Times reported, “A big battle may be shaping up in southern Somalia between the Kenyan military, which took the unusual step of sending hundreds of soldiers into Somalia over the weekend, and the Shabaab militant group, a ruthless franchise of Al Qaeda that vowed Monday to attack Kenya in retaliation” (Gettleman, 2011). Moreover, while the two countries are clearly line up for a bilateral confrontation that has the potential for long-term entrenched warfare, the Kenyan military commanders have acknowledged that their main goals are to push the Somali-terrorist back from the border with Kenya (Gettleman, 2011). As Kenya and Somalia fall into the next phase of conflict, full-fledge (bilateral warfare), the prospects for an improvement in relations and conflict conditions in this region does not appear promising. As the Sahara desert expands and dryer conditions reach this region the carrying capacity for the herding lands will dramatically decrease along with the rainfall, which will further impact the movement of people as well as their ability to access livelihoods and food sources. These patterns will continue to fuel conflict and enhance the powers of the militants and warlords in the region (which ignited Kenyan troops invasion into Somali territory in the first place). The decades long idea of this region being a place of “not peace not war” (Menkhaus, 2005) seems to have dramatically shifted to a place of not peace, but war. There are a multitude of actors in this conflict including both sovereign and non-sovereign actors. The Kenyan Government is a main actor sovereign actor, who has exhibited little strength in maintaining the border region, but has recently invaded Somali national territory. Additionally, this conflict engendered many non-sovereign actors working in the region to either mitigate or exacerbate tensions. These non-sovereign actors include, Al-Shabaab and clan warlords who have asphyxiated much of the economic and political capacity in the region and have exacerbated the conflict and tensions due to their illegal arms trade and the militarization of pastoralists and refugees communities in the region. Additionally, pastoralists, farmers and their respective clans are non-sovereign actors in the region, who have not only suffered from the dramatic impact of climate change, but have also been fighting territorial conflicts since before the time of colonial rule. Moreover, refugees and IDPs have also emerged out of the altering impact of climate change and the increased violence in the region, as non-sovereign actors. Finally, one can see the entrance of foreign aid workers, as well as local assistance programs, prop up in the region due to the extended conflict and particularly food insecurities. These non-sovereign actors are particularly important for the future recovery of the area as they are seeking to abate the conflict and assist those displaced by both the violent conflict and the impact of the drying conditions. Many projections of climate change in Africa suggest that the continent will face a warming of .2C to .5C per decade (Desanker, 2002) and these warming temperatures will engender erratic rainfall patterns in the region. Eastern African nations, such as Kenya and Somalia, will face increase in overall temperature. One study suggests that the mean annual temperature has increased from 1960-2006 by at least 1°C in Kenya and 1.3°C in Ethiopia, and both countries are experience a higher frequency of hotter days (Oxfam, 2011). While this region does have a history of draught, IRIN estimates that there have been 42 droughts since 1980 (IRIN, 2011). However, currently the periods of drought are becoming longer and more frequent due to the increasing regional temperatures and the decrease in rainfall. “According to surveys of local communities, the climate in the Horn is experiencing an increase in the rates of drought. Reports from the Kenya Food Security Group and from pastoralist communities show that drought-related shocks used to occur every ten years, and now are occurring every five years or less. Borana communities in Ethiopia report that whereas droughts were recorded every 6-8 years in the past, they now occur every 1-2 years” (Oxfam, 2011). It is suggested that from Fenruary to July 2011, the region has experienced rainfall from 2 to 8 inches below normal (Walsh, 2011). These warming climates and lack of rainfall will put a massive stress on the carrying capacity of the land particularly for famers and herders, andwill also beget issues of large-scale droughts procuring dramatic issues of food insecurity for the region. Due to the region’s extreme dependency on natural resources (such as cattle and crops), the altering of climate patterns have the capacity to put a huge strain on existing resources, particularly with regards to food sources. Studies suggest that the increase in number and severity of droughts in Somalia have cut production of their national consumption needs (IRIN, 2011). Moreover, this increase in regional temperature and decrease in overall rainfall will further cause desertification of the land, which will decrease its carrying capacity and force populations (particularly farmers and pastoralists) to continue to move southward. It is estimated that by 2080, the proportion of arid and semi-arid lands in Africa will likely increase by 5 to 8% (Boko et all, 2007). A recent study suggests that there will be a drastic decrease in the “long rains” (from March to June) from 1980 to 2009 (Oxfam, 2011), which will continue to dry out the land and in ability for framers and herders to participate in their traditional livelihoods. Additionally, this increased pressure on the land will create even more severe food scarcities in the region, due to the inability to grow traditional crops combined with the slow nature or potential inability of the populations in this region to adapt their food production to meet the altering environment (Boko et all, 2007). A report for the IPCC suggests that the length of the growing season will be reduced, for some countries by as much as 50% by 2020, which could lead in a drop of crop net revenues by up to 90% by 2100, which would predominately effect small scale farmers (Boko et all, 2007). It is predicted that Eastern Africa may lose up to 20% of the growing period of key crops by the end of this century (Oxfam, 2011). This is particularly worrisome in countries, such as Somalia, Kenya and other nations in the Horn of Africa who are extremely dependent upon rain-fed crops such as: corn, wheat, teff, sorghum and beans as their staple source of food and income. It has been suggested that in Somalia and Northern Kenya, where food and income generation are already extremely limited, this changing nature of farming and land use could spiral into a devastating humanitarian crisis. “The United Kingdom's Division for International Development projects that crop yields of rice, maize, and wheat will fall up to 10 percent in Somalia and across the Sahel region by 2030” (Stimson Center, 2011). Moreover, reports from Oxfam suggest that by the end of this century the capacity to grow beans (one of the major crops and staple foods) will decrease by 50% in the East African region (Oxfam, 2011). The stifling of crop production in this region has fostered and will continue to generate situations of dire famine. “Nancy Linborg, an official with the U.S. Agency for International Development (USAID), told a Congressional committee that more than 29,000 children under the age of 5 had died over the past three months in Somalia, thanks to the famine. If conditions worsen—and there's little reason to expected that they won't— upwards of 800,000 may die of hunger and other causes” (Walsh, 2011). 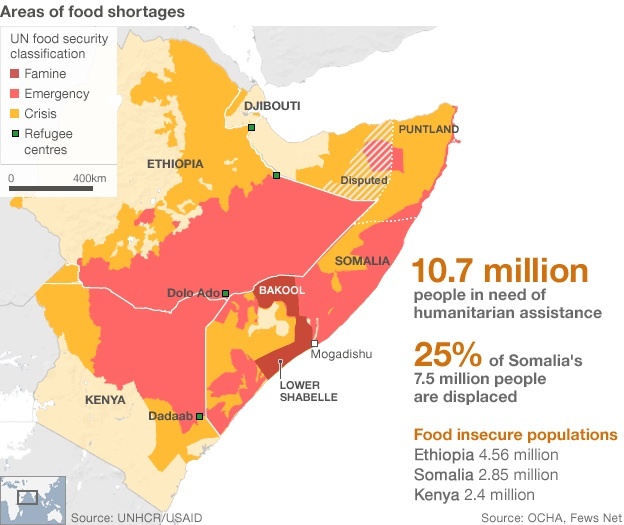 Moreover, as previously mentioned famine-like conditions in Southern Somalia has forced populations across national borders, creating dire conditions of hunger and extreme poverty, particularly in the Garissa District of North East Kenya, home to Dadaab refugee camp. The current drought clearly connects to the severe drying conditions created by the La Niña phenomenon**, which lasted from June of last year to this May in the Pacific Ocean (Walsh, 2011). However, in 2007 the IPCC suggested the Eastern African region may in the future experience more intense rainfall as a product of the El Niño phenomenon, which will have the capacity to erode much of the land.El Niño has been accused of carrying more sporadic and dramatic rainfall patterns to the region. This has made the monsoon season irregular and often far more intense procuring large-scale floods, massive destruction of infrastructure as well as modifying the planting season (Walsh, 2011). While it can be argued that the root of this conflict falls under the auspicious of an internal conflict in the form of the Somali civil conflict, it can also be considered an interstate conflict, which was illuminated by the October 2011 Kenyan invasion of Southern Somalia. 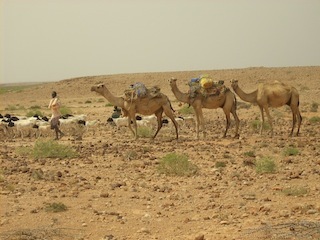 Moreover, while the source of this interstate confrontation can most notably be attributed to conflict spillover from the Somali civil war this confrontation has further exacerbated the aforementioned underlying territorial tensions between semi-nomadic pastoralists in Northern Kenya and Southern Somalia as well as by the changing climate. The multiple nodes of conflict highlight the crisis in the Horn and have drastically impacted regional tensions that date back to before colonization. These trigger effects lie at the origins of the bilateral conflict, and therefore assist in the assessment that this conflict would be considered a high level. Death tolls in the region based on the famine alone have reached 300,000 and when combined with estimates on conflict-related deaths, could total upwards of a half million people. Estimates range dramatically in number of casualities of this conflict. This is primarily due to the intricate nature of the conflict as well as its dire implications. Additionally, the lack of a viable central authority in Somalia (since the dimise of the Siad Government and the inability of aid workers and foreign authorities to enter the region) has made hard numbers virtually non-existant. However, some have projected that the the Somali civil conflict has procured a death toll of roughly 550,000 people from the year 1991 to 2004 (Scaruffi, 2009). This figure however, does not include the vast numbers of innocent people who have lost their lives to worsening famines. Some sources suggest that in past years famines have claimed numbers reaching 300,000 people (Berry, 1991). Most interestingly, prior to the current drought and subsequent famine the worse recorded cause of famine for the Somali nation was in the early 1990s, correlating with the collapse of the Siad Government and complete chaos that enveloped the country afterward. Current estimates place death tolls in the stratosphere when compared to past spouts of regional famine. Classified as the worst drought in 60 years, some reports indicate that over 29,000 Somali children under the age of 5 have perished and roughly 640,000 children are acutely malnurished (Nor and Straziuso, 2011). Moreover some statistics estimate that 3.7 million Somalis are living in crisis and 2.8 million of those are living near the southern border with Kenya and Ethiopia. Moreover, as many as 750,000 Somalis could die in the upcoming months due to extreme drought and famine conditions, none the likes of which this region has experienced. (World Vision 2011). Finally, while the combat death toll has remained steady particularly between clan conflict and Al-Shabaab militants, and the number of civilians losing their lives daily to starvation has jumped dramatically forcing a mass exudous of people. Most specifically those fleeing Somalia and entering Kenya's refugee camps. Dadaab, which has witnessed up to 3,500 peoples per day seeking refuge (Care, 2011). 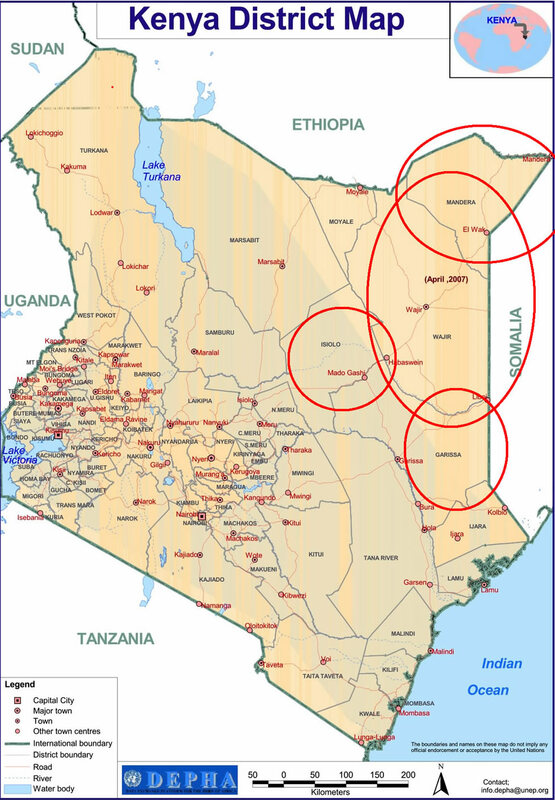 Since this conflict has roots in civil conflict, but is truly examining the interstate confrontation, it seemed essential to consider the overlap both locally in the context of the Somali civil conflict and then bilaterally, which will look at the overlap in environment and conflict in the Kenyan Somali conflict context. 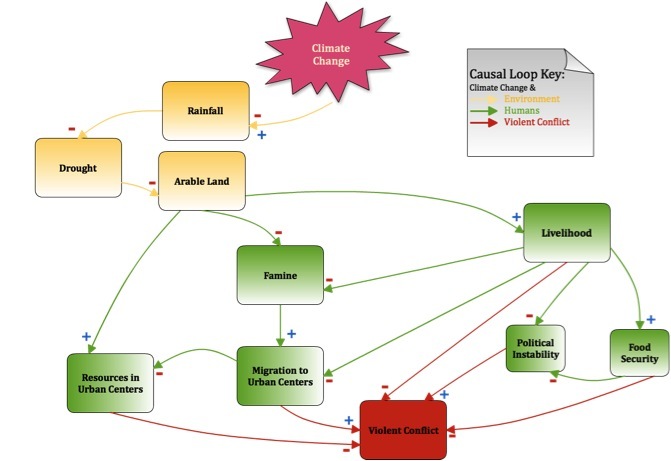 Somali Civil ConflictThe causal loop below demonstrates the intricate correlation between the current conflict in Somalia and changing climate that is dramatically affecting the region. The diagram is siphoned into three different, but highly interconnected sections: the effects of climate change on the earth, the effects of climate change on humans in relation to migration, political stability and livelihood and finally the effect of climate change on human conflict. Below describes the relationship between these moving components that are clearly not mutually exclusive. Climate change is directly affecting the weather patterns in this region, which has had direct implications on the rainfall. This change in weather fosters a positive and negative relationship with the envi ronment (i.e. generating a more dramatic raining season as well as a much more dire dry season). This project is going to closely examine the dry season, which due to climate change is becoming a longer and drier period (negative correlation). This increased severity and occurrence of conditions for drought is affecting the amount of arable land (negative correlation) that is available to farmers and pastoralists as a mean for livelihood (negative correlation). This inability to participate in the local economy because of draught extends into the next portion of the causal loop diagram, which explores the influence climate change has on humans. As climate change alters environmental conditions it engenders a large impact on humans, which transpires through multiple vehicles. This causal loop examines the overall impact of climate change on human conflict in Somalia and specifically considers the social implications as well as the migratory issues that arise due to climate change. As the amount of arable land becomes drastically diminished due to the lack of rainfall, farmers (who grow rain-fed crops like maize and wheat) as well as pastoralist (who hold a predominate role in Somali culture) lose their means to livelihood (positive correlation). When conditions exist that do not permit the farmer to farm or the herder to maintain his livestock, famine is oftentimes the outcome (negative correlation). 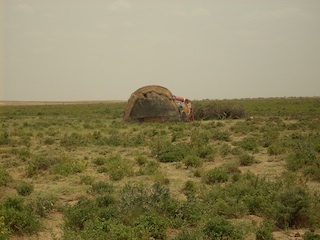 For example, if wheat farmers in southern Somalia can no longer grow their crops this not only generates dire repercussion for their families, specifically in their personal loss of livelihood, but also has a societal impact, as food security becomes a glaring issue of national concern (positive correlation). With less food, there is a heavier competition among people in rural as well as urban settings over this basic resource. However, in a country such as Somalia where there is no stable governmental structure, this diminished ability to access food for the local populations further augments the lack of political stability faced by the country (negative correlation). Political instability is further created as the farmers and herders become upset with their conditions and the lack of assistance received from the government (negative correlation). For example, these conditions could force the farmer to take up arms against Al-Shabaab or join the militia due to lack of another viable option to support his family. This loss of livelihood, faced by farmers, herders and those who depended upon their crops and livestock, forces large-scale migration from rural areas to urban settings in search of employment, food and better living conditions (negative correlation). However, urban resources are already heavily burdened by the lack of economic activity and food scarcity (positive correlation), so the mass influx of unskilled laborers moving into urban centers exacerbates an already contentious situation (negative correlation). Therefore, the farmer cannot find work and continues to be unable to support his family, which generates anger among the general population and influences the overall instability in the country. Finally, this causal loops considers the implications that this dramatic loss of livelihood and extreme circumstances of poverty has on social conditions. Often times, this lack economic productivity and endemic poverty translates into violent conflict. In the case of Somalia, with its already vulnerable and flimsy political and governing structure, conditions of famine and mass migration beget a much more violent and unstable climate. Moreover, with these altering social and migratory conditions, the country finds itself in a vacuum of political instability, which increases the climate for conflict (negative correlation). As concerns surrounding food security begin to raise this will create more situations of violent conflict (negative correlation). Furthermore, fewer overall resources in an area, particularly an urban setting will increase occurrences of violent conflict (negative correlation). This causal loop demonstrates the dynamics between to the events that are occuring in Somalia (particularly as seen with the Somali civil conflict) and how these interactions are impacting their neighbor (Kenya), and to this end are inciting the Kenyan Somali conflict. "Al Shabab." Times Topics - The New York Times. 17 Oct. 2011. Web. 12 Nov. 2011. <http://topics.nytimes.com/top/reference/timestopics/organizations/s/al-shabab/index.html>. Daily Nation (Nairobi), "Aid crisis as Somali (accessed June 29, 2011). Bariagaber, Assefaw. Conflict and the Refugee Experience. Aldershot: Ashgate, 2006. Print. Berry, LaVerle. "Ethiopia - Ethiopia in Crisis: Famine and Its Aftermath,1984-88." Country Studies. Ed. Thomas P. Ofcansky. Library of Congress, 1991. Web. 04 Dec. 2011. <http://countrystudies.us/ethiopia/35.htm>. Brown, Ben. "Horn of Africa Tested by Severe Drought." BBC - Homepage. 4 July 2011. Web. 8 Nov. 2011. <http://www.bbc.co.uk/news/world-africa-14023160>. Care. ""The Worst Crisis in the World Today" Lives Hang in the Balance." Care. 5 Sept. 2011. Web. 12 Nov. 2011. <http://www.care.org/emergency/Horn-of-Africa-food-poverty-crisis-Dadaab-2011/index.asp>. Desanker, Paul V. Center for African Development Solutions. World Wildlife Fund. “Impact of Climate Change.”Johannesburg, South Africa. <www.worldwildlife.org/climate/Publications/WWFBinaryitem4926.pdf>. "Fleeing Somalis Struggle To Find Shelter At The World's Largest Refugee Camp." Doctors Without Borders. <http://www.doctorswithoutborders.com/news/article.cfm?id=5371&cat=field-­-news> Web 1 July 2011. Gettleman, Jeffrey. "Somali Militants Threaten Kenya Over Cross-Border Troops." The New York Times. 17 Oct. 2011. Web. 7 Nov. 2011. <http://www.nytimes.com/2011/10/18/world/africa/somali-militants-vow-to-attack-kenya.html?_r=1>. Horst, Cindy. Transnational Nomads: How Somalis Cope with Refugee Life in the Dadaab Camps of Kenya. New York: Berghahn, 2006. Print. IRIN. "HORN OF AFRICA: Fast Facts about the Drought." IRIN • Humanitarian News and Analysis from Africa, Asia and the Middle East - Updated DailIRIN, 5 Aug. 2011. Web. 04 Dec. 2011. <http://www.irinnews.org/report.aspx?reportid=93426>. "IRIN Africa | SOMALIA: Number of drought-displaced arriving in Mogadishu "dropping" | Somalia | Early Warning | East African Food Crisis | Environment | Food Security | Natural Disasters | Refugees/IDPs." IRIN • humanitarian news and analysis from Africa, Asia and the Middle East - updated daily. N.p., 11 Aug. 2011. Web. 14 Sept. 2011. <http://www.irinnews.org/report.aspx?reportid=93446>. Kron, Josh. "Somalia." Times Topics - The New York Times. 3 Nov. 2011. Web. 12 Nov. 2011.<http://topics.nytimes.com/top/news/international/countriesandterritories/somalia/index.html>. Menkhaus, Ken. Kenya-Somalia Border Conflict Analysis. Publication. Washington, DC: USAID, 31 Aug. 2005. Print. Menkhaus, Ken. "The Raise of the Mediated State in Northern Kenya: the Wajir Story and Its Implications for State-building." Afrika Focus 21.2 (2008): 23-38. JSTOR. Web. 10 Nov. 2011. Nor, Mohamed, and Jason Straziuso. "29,000 Somali Children Under 5 Dead In Famine: U.S. Official." The Huffington Post. The Huffington Post, 4 Aug. 2011. Web. 04 Dec. 2011. <http://www.huffingtonpost.com/2011/08/04/somalia-famine-children-dead_n_917912.html>. Odhiambo-Abuya, E. "United Nations High Commissioner for Refugees and Status Determination Imtaxaan in Kenya: An Empirical Survey." Journal of African Law 48, no. 2 (2004): 187-206. Provost, Claire and Hamaz Mohamed. "Dadaab refugee camps: 20 years of living in crisis." The Guardian, March 24, 2011. <http://www.guardian.co.uk/global-­-development/2011/mar/24/dadaab-­-refugee-­-camps-­-living-­-in-­-crisis> Web 28 June 2011. Scaruffi, Piero. "Wars and Casualties of the 20th Century." Piero Scaruffi's Knowledge Base. 2009. Web. 04 Dec. 2011. <http://www.scaruffi.com/politics/massacre.html>. Sheikh, Abdi . "Somalia clashes kill 138 in two weeks -rights group." Reuters, January 15, 2010. http://madaale.com/?p=145 (accessed June 28, 2011). Stimson Center. 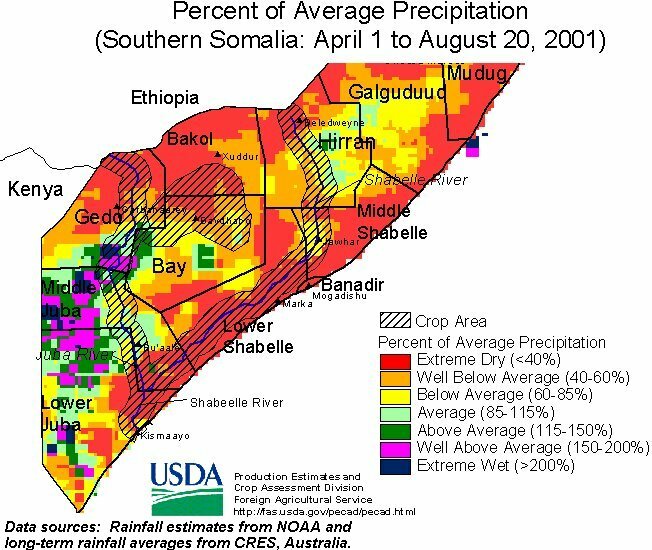 "Climate Change and Famine in Somalia | Spotlight | The Stimson Center | Pragmatic Steps for Global Security." The Stimson Center | Pragmatic Steps for Global Security. Stimson Center, 9 Aug. 2011. Web. 14 Sept. 2011. <http://www.stimson.org/spotlight/climate-change-and-famine-in-somalia/>. "The Regional Impacts of Climate Change." IPCC - Intergovernmental Panel on Climate Change. Web. 12 Nov. 2011. <http://www.ipcc.ch/ipccreports/sres/regional/index.php?idp=11>. UNHCR. "UNHCR - Somalia." UNHCR Welcome. http://www.unhcr.org/pages/49e483ad6.html (accessed September 14, 2011). UNHCR Dadaab Camp Population Statistics, 26 June 2011. Somalia - Ecocentric - TIME.com." Ecocentric - A blog about all things green, from conservation to Capitol Hill - TIME.com. N.p., 4 Aug. 2011. Web. 14 Sept. 2011. 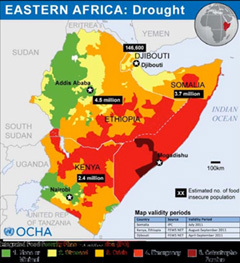 <htp://ecocentric.blogs.time.com/2011/08/04/el-nino-la-nina-climate-change-and-the-horrific-drought-in-somalia/>. Wasara, Samson S. "Conflict and State Security in the Horn of Africa: Militarization of Civilian Groups." Africa Journal of Political Science 7.2 (2002): 39-60. Web. 9 Nov. 2011. World Vision. "Somali Famine Reaches Historic Level." Sponsor a Child. World VIsion, 22 Sept. 2011. Web. 04 Dec. 2011. <http://www.worldvision.org/home.nsf/home/world-vision-news/famine-in-somalia-2-1426?Open>. Zenko, Micah. "What's Wrong With Kenya's Invasion of Somalia - Micah Zenko - International - The Atlantic." The Atlantic — News and Analysis on Politics, Business, Culture, Technology, National, International, and Life – TheAtlantic.com. 28 Oct. 2011. Web. 10 Nov. 2011. <http://www.theatlantic.com/international/archive/2011/10/whats-wrong-with-kenyas-invasion-of-somalia/247517/>.